Back during the 1950s, the most fertile breeding ground in boxing had to be a section of North Philadelphia known as Strawberry Mansion. Gil Turner, Jimmy Hackney, Sugar Hart, Charley Scott, Von Clay, Bob Cofer, Stanley "Kitten" Hayward, and Len Matthews were all products of this neighborhood. 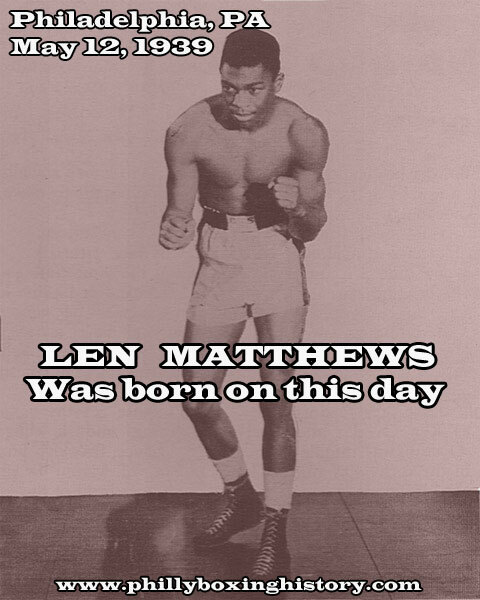 Len Matthews was born on May 12, 1939. Tall and lean, trigger-fisted with terrific power in both hands, he had already been wowing boxing people and fans long before he turned pro. Signing with Anthony Graziano and his surrogate father, Quenzell McCall (another Strawberry Mansion legend as proprietor of Champs Gym), he launched his pro career with much fanfare as a six round co-feature with Jake Josato on November 7, 1957 at the Cambria. Len stopped Charles Carter in the third round and became a big attraction for Al Lewis. Within six months he had scored nine straight knockouts and was such a sensation that he headlined the Deborah Hospital Show at the Arena in May, administering a terrific beating to the veteran Henry "Pappy" Gault, who barely managed to last the eight round limit. Len next encountered hard punching North Philly rival Henry "Toothpick" Brown at Connie Mack Stadium as a supporting bout to Sugar Hart and Gil Turner. Matthews stole the show as he blasted out Brown in spectacular fashion in the fourth round, even overshadowing Georgie Benton’s sensational knockout of "Slim" Jim Robinson on the same card. Now the whole town was talking about this new phenom who seemed to have it all. The following month he was showcased in New York in a semi-final of a Madison Square Garden show by destroying the rugged Bobby Rodgers in three rounds, breaking his jaw in the process. Teddy Brenner now wanted Len to headline at St. Nicholas Arena, on the Dumont Television Network, against the tough New Englander, Steve Ward, whom he flattened in the ninth round with a performance that had the New Yorkers’ tongues wagging. The Friday Night Fights were next for Len and he impressed a national audience with his skill and firepower easily beating Tommy Tibbs (a recent victor over Willie Pep). His next assignment was the cute Cuban warhorse Orlando Zulueta at Convention Hall. Showing great determination after receiving a gaping wound on the left eyelid in the fourth round, Len blazed away with both hands at the former title challenger, dropping him in the sixth and seventh rounds and, having his man in full retreat, drubbing him the rest of the way. On the surface, everything seemed great. In less than a year, Len was the talk of boxing. He was featured in The Ring magazine as the "New Lightweight Sensation." Boxing Illustrated headlined its article on Len as "Boxing’s Million Dollar Baby." He was labeled "can’t miss" and the "Philly Phenom" in the press. But, some wise old railbirds cautioned of too much too soon. Crusty disciplinarian Quenzell McCall and Anthony Graziano had been partners since 1955 and had enjoyed a good working relationship. Tony took care of the business end and McCall made all the boxing decisions. Now, with the prospect of huge money, there appeared to be a crack in the foundation as reports of encroachment into each other’s expertise by both was leaked. On December 22, 1958 fighting in a tune-up for Al Lewis at the Cambria against club-fighting journeyman Ray Lancaster, Len was hard-pressed to get a draw from the officials. Only a desperation last second knockdown saved his undefeated string, now at sixteen. Three weeks later, Len was again on national television meeting top west coast lightweight Paulie Armstead at the Hollywood Legion Stadium. Fighting well, Len’s unbeaten streak was ended by what Boxing Illustrated called "probably the worst decision of the year." Some unfinished business with Ray Lancaster the following month at Convention Hall lured 6,930 fans as Len seemed to regain his old fire demolishing the opponent in the second round. After this bout, Matthews purchased a brand new car over the objections of McCall, who believed automobiles made a fighter lazy. Of course, Tony approved saying the kid deserved some rewards for his achievements. Some 6,881 fans were on hand on April 13, 1959 at the Arena to witness the most anticipated lightweight match in years as Matthews faced New York wonder boy Carlos Ortiz. After a terrific "give and take" battle for five rounds, Len was hurt with a screeching left hook in the sixth round. Ortiz opened a blistering assault, trapping him on the ropes. Len was unable to defend himself and referee Pete Pantaleo jumped in to stop it. Tension between McCall and Graziano increased and many thought that Len would never be the same after taking such a terrible beating. Daily News boxing writer, Jack McKinney, disagreed, comparing Matthews’ defeat to that of Ike Williams’ loss to Bob Montgomery, and predicting that Len might come back better than ever and maybe whip Ortiz somewhere on down the line just as Williams had done to Montgomery. Looking better than ever, Matthews went on a brilliant fifteen-bout run that was to establish him as the "Number One" challenger for the Lightweight Championship. Only a highly disputed loss to South African welter Willie Toweel, after decking him twice at Madison Square Garden, and a Miami Beach "hometown" draw with Doug Vaillant (that the press and a national audience thought Len won decisively) marred the string. Impressive television wins over contenders Johnny Gonsalves, Candy McFarland, and Paulie Armstead and sensational knockouts over Johnny Busso in one round (at the Arena with 7,648 looking on), longtime contender Arthur Persley at the Cambria in four, and a three round stoppage of top-rated Kenny Lane, screened from the Olympic Auditorium in Los Angeles, highlighted the skein. During this stretch, Graziano replaced McCall with Johnny Hutchinson. Hutch, like McCall, was a top-notch teacher but he was not the disciplinarian the former trainer was and rumors of Len’s flashy lifestyle were reported. The break-up with McCall was ironic since he and his wife had welcomed Len to live in their home for a few years before he married. They considered him a son. Tony, who had genuine affection for Len as well, seemed to indulge his every whim and his preparation for a rematch with Doug Vaillant on December 6, 1960 at Convention Hall seemed to lack the intensity needed against such a talented opponent. Bringing back memories of the Carlos Ortiz debacle twenty months before, Vaillant caught Len with a vicious barrage of head shots on the ropes in the opening round that he somewhat survived. But, he took a battering throughout the bout and lost his chance for the title shot. A savage beating by Paolo Rosi the following May in Madison Square Garden forced Matthews’ suspension by the New York Commission which requested that Len undergo electric brainwave tests before he be allowed to box in New York again. Although never the same, he still had enough to knockout cross-town rival Jimmy Soo in the eighth round of one of the most sensational battles in local Philadelphia boxing history. But, when Kenny Lane exacted full revenge on Lenny at the Arena on September 15, 1962, dishing out such a frightful beating that referee Sweeney was forced to stop the slaughter in the ninth round, Tony Graziano and the Pennsylvania Commission requested that Len retire. Taking a nine-month layoff, Len returned to the ring for one last drive. Hooking back up with Quenzell McCall and adhering to strict training laws, Len scored six straight knockouts and returned to the ratings. Eye problems finally forced Len to call it a career after losing a ten round decision to Chico Veliz (whom he had previously knocked out) at the Arena three weeks shy of his 25th birthday. A won-lost log of 42-10-3 with 29 knockouts and a "can’t miss" prospect who just did miss, he was one of Philadelphia’s boxing legends.